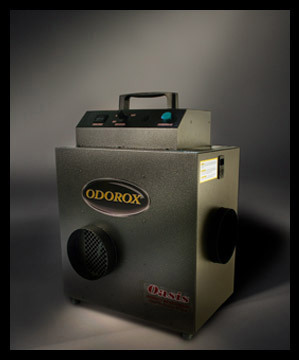 The Odorox® Oasis unit was designed for easy and unobtrusive residential applications usually in spaces up to 2500 sq.ft. (250 sq.m.) assuming a ceiling of 9ft/3m as it can be easily fixed to an existing HVAC system or for hospitality situations where the unit can be conveniently ducted into a space whilst located outside. It is an ideal unit to continuously neutralize musty smells, cooking odours, cigarette smoke, pet odours and neutralise biological pathogens as it can operate 24 hours a day, 7 days a week. It is also highly suitable for the chemically sensitive or medically compromised individual. Oasis™ is equipped as standard with a single optic and a washable filter, a built-in fan adjustable from approximately 250 to 500 cfm, and it operates using only 1.4 Amps. Odorox®, Oasis™ and HGI Industries Inc. are either registered trademarks or trademarks of HGI Industries Inc. of Boynton Beach, Florida USA. Other trademarks are pending in the U.S. and other countries. Please call 0208 123 5680.